Midtown has an enviable transportation network that provides easy access with abundant travel choices, including four MARTA rail stations, bus service and local circulators. A pedestrian-oriented network of well lit, tree-lined sidewalks makes it easy to walk everywhere. And cyclists benefit from extensive – and expanding – bike lanes and bicycle racks. By far, the easiest way around Midtown is in foot. With 14 miles of new sidewalks - featuring streetlights, more than 700 trees and new public plazas and pocket parks - there's never been a better time to stroll Midtown. Download your Midtown Walking Map. In the Midtown core, its always an easy walk to a MARTA rail station, or an even shorter hop to a bus stop. Whether you are headed to Atlanta Hartsfield-Jackson International Airport or Buckhead's Lenox Mall, it’s a relaxed one-seat ride on the train. And it’s easy to ride MARTA. Two free public circulator shuttles take you to some of Midtown's key locations. The Tech Trolley provides service between the Campus Transit Hub and the Midtown MARTA Station, stopping at many locations throughout campus and Midtown along the way. The Atlantic Station shuttle runs along the 17th Street bus only lane from the Arts Center Station to The Flats and IKEA -- making stops at designated MARTA bus and other stops. Midtown’s street grid and significant bike lane network makes getting around by bike easy, safe, and convenient. 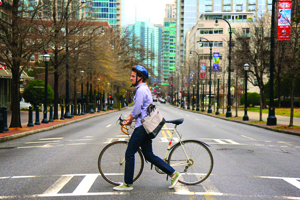 With near-term plans to connect the Midtown core with the BeltLine’s Eastside Trail, add new protected bike lanes on Juniper Street, and install additional bike racks, Midtown is poised to become Atlanta’s bike mecca. Ride the City makes planning your next bike trip a snap. Midtown’s accessibility is unparalleled, with easy access to I-75/85, and connections to the bustling Westside via five bridges. Midtown is also home to dozens of ZipCar locations, which you can find on the map below. The Midtown Alliance is always working to improve our transportation network, from better traffic flow through signal management, intersection improvements, wayfinding signage and enhancing Midtown’s gateways and bridges. Get the latest news on our how we’re making getting around easier for you.